If we imagine ourselves in the place of a developer who's interested in game making and is choosing a game engine. He wants to know why exactly choose Gideros, what is there so good, why not choose corona or whatever else. If we had to make a 'landing page', what would we place there? What would you suggest if we had to make a very concrete list? Good idea, then when the main website gets updated they have a list to pick from. You have a wiki account. @oleg I'm not sure how far can we go with other people's assets. To me it's very inconvenient to decipher other people's code. And their image collections are useless cause anyway I'll have to add more sprites there, and my sprites won't match their style (unless it's very primitive, like 'flat style'). I agree with @oleg in as far as the quick start and examples. Gideros has not been great in this respect. And @Apollo14 is correct when it comes to asset packs.. they always leave out something.. and quite often are made by people who have no idea about programming so all of their assets are queer non programming dimensions! Any code shared should be easy to read. If it's too complicated then people will switch off. On the other hand as long as the documentation is good (for say a particle class) then people just need to know what to feed the class to get the desired result.. they don't ever have to look at the code if they don't want to. If I was to make a landing page.. err.. hangon.. I did! I made it one page, easy to see the features, and had links to immediately get started! It was not well received so I just deleted the entire thing. 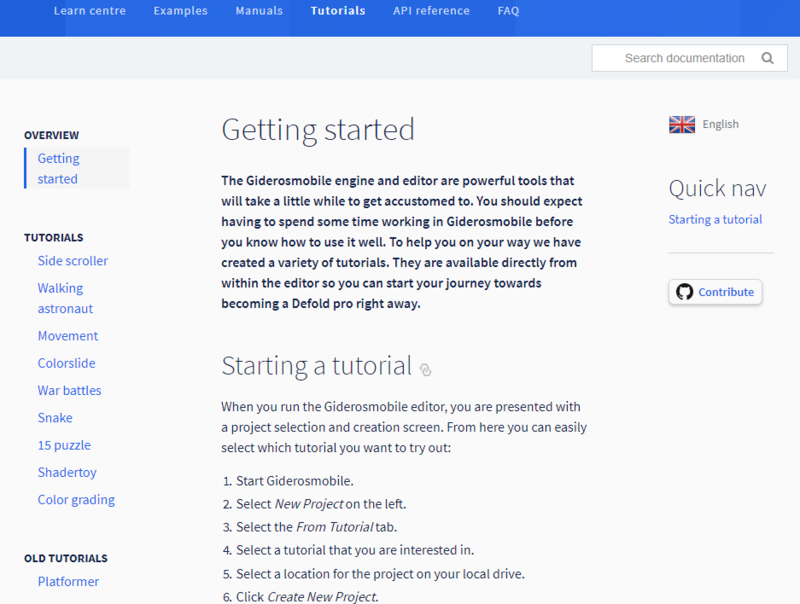 I've updated page "Why use Gideros", added 7 advantages, as I see it. It would be great if you add some more and help to improve the page (maybe also check grammar). @Apollo14 I think that one of the reasons why I choose Gideros over "the crown" and others, was the ability to compile apps locally on my laptop. Another reason worth mentioning now in the list is that it is free and Open Source. If you're not happy with it (which is an unexpected event imho) you can always switch to another engine, or - if you are skilled enough - you could pick up the source and improve it to your needs. @pie thx, that's very good reasons, I've added them. @SinisterSoft @hgy29 can you create new page in wiki? "Third party tools" (or something like that), we should add there programs like Zerobrane, TNT Animator, Texture Packer, etc.